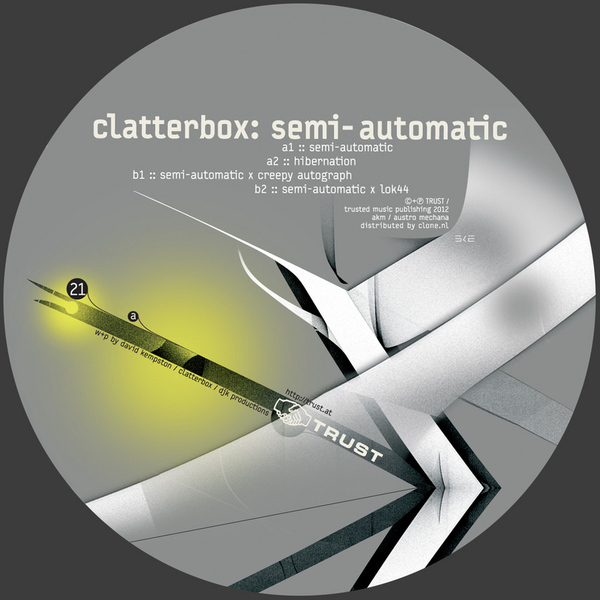 A pair of proper Electro winners from UK stalwart Clatterbox, backed with Creepy Autograph (Jimmy Edgar) and Lok44 remixes for Vienna's Trust institution. 'Semi-Automatic''s a straight ace, rollin' on wide-style bass and glyding synth pads hitting the mark somewhere between vintage Gescom and DJ Stingray, whilst 'Hibernation' goes harder on the kick/snare sync to body rocking effect. It's probably a bit of cliché to say this now, but Jimmy Edgar's Creepy Autograph remix lends some sexiness to the affair - a gyrating halfstepped grind ready for redlit clubs in the neon quadrant - for Lok44 to serve 3AM warehouse functions with his percolating perspective.